Funded by a grant from the Andrew W. Mellon Foundation, The Graduate Institute for Design, Ethnography & Social Thought at the New School incubates advanced transdisciplinary research and practice at the intersection of social theory and design and fosters dialogue on related themes across the university. Conceived and organized by GIDEST Fellows Barbara Adams, Scott Brown, and John Bruce, Ethnography in the Expanded Field is a project that collects and archives responses to and artifacts from ethnographic practice from a wide range of perspectives. Contributors to the archive hail from a diversity of professional and disciplinary backgrounds including anthropology, sociology, geography, political science, art, and design. In the convergence of varied ideas and practices, the archive serves as an acknowledgement of the partiality embedded in disciplinary efforts to understand the world. Fragments from the field along with commentary on practice, invite interpretation, debate, and conversation. 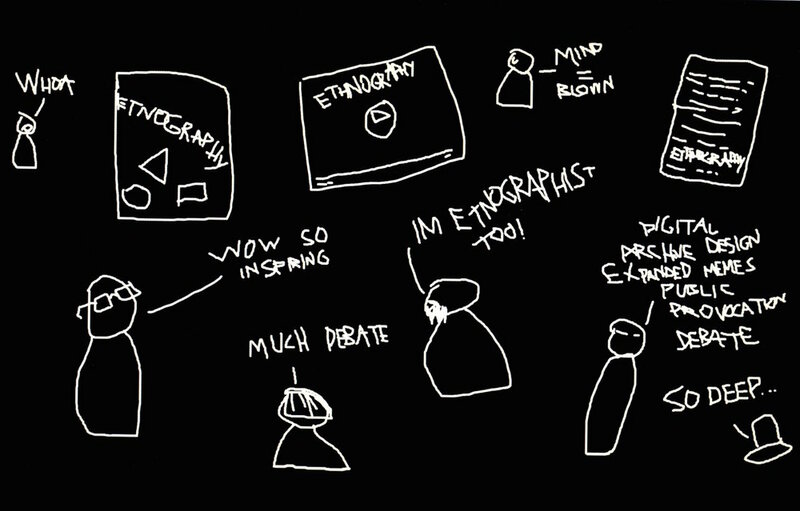 Ethnography is variably understood as a set of tools, a way of seeing, a research disposition, an ethical orientation, and a mode of writing, as well as an effort of generating concepts. Historically associated with social scientific research, ethnography today is just as likely to be claimed as a practice in art and design as it is in anthropology. The expansion of the field—a source of consternation and loss of identity for some, a source of inspiration and possibility for others—is now a practical reality.